How the tree looked early in the season. I went out to weed the front garden early this morning while it was still cool. The bed runs right along the sidewalk on Colchester Avenue in Burlington, VT, so I like to keep it nice. Every year, my spouse and I plant something different, featuring colorful annuals. This year’s design includes a banana tree, which someone decided to cut down during the night. Over the years, our front garden has drawn the attention of the people who walk by, and many take time to tell us how much they enjoy it. We get comments while we are weeding; people have left notes in our mailbox, and some have even walked up to the porch to chat. Why does someone decide to cut down a 6-foot treasure that has been overwintered carefully since 1990-something? Part of me is angry. What kind of jerk does this? I can deal with random acts from nature, but this is not random. This person had to think it through a bit. Maybe we’re asking for it, planting such a strange, exotic plant in the front yard on a busy street. Should we stick to junipers, or a hedge of prickly roses? I know this kind of vandalism happens to gardeners everywhere. Planting a garden in a public space is risky, I guess. Who hasn’t seen a street-side tree cut down or crudely snapped off by a vandal? What a heartbreak. On my way to work, I usually look at the gardens along the way. I see how they change through the season. I note when someone tries a new plant or reworks a bed. I feel a connection with those gardeners, even though we haven’t met. 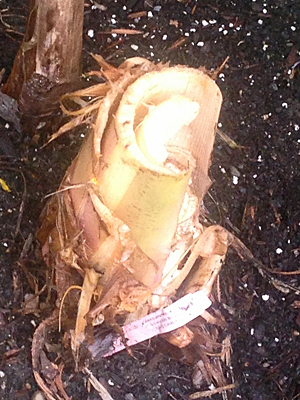 For now, the banana stump looks a lot like celery, all watery and crisp. Eventually, it will dry out and, I hope, the side shoots will emerge and grow into a new tree. Yes, gardens connect us. They also give us hope. 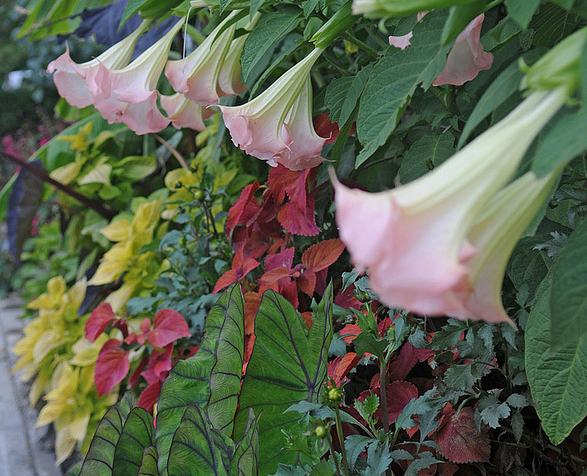 Last year’s display featured a row of brugmansias (angel’s trumpets), some dahlias and lots of coleus. That’s so sad! Do they think they can root it in their yard? We have had problems with theft but never this. They seem to like birdbaths in our area. I’m so sorry. I walk up the hill from Winooski to FAHC and so admire your garden, it brightens my commute, I love to watch it change with the seasons! I’m so sorry for your loss. Your garden is beautiful! How terrible! I feel so bad for you. Last year someone stole a planter basket of petunias from my front porch and walked down the block shredding them into the neighbor’s yard. I was really ticked, so you must be livid. People can be such stinkers to destroy something so beautiful. You’re just trying to share and they don’t appreciate the gesture. That is sooo rude! I caught a neighbor down the street walking past my house with a plastic bag and a pair of shears. When she got to my roses, she pulled out her shears to cut my flowers, if you can believe it. I gave her an earful. Oh I am SO sorry. I get ravaged by deer and other critters. Sometimes I’m thinking damage has been done by a person but we live way out and have large lots. I love the way you expressed this and is one of the reasons I love my fellow gardeners. In my neighborhood I have come to realize that gardening unites us even more powerfully than politics. I can get along with my neighbors who don’t share my politics as long as we share a passion for plants and animals. There is one gardener who will spray to destroy all the butterfly larvae because she cares about her plants and is not particularly interested in the creatures they attract. I try to be friendly but am having trouble getting beyond this but I do understand I guess cause at times I do feel like taking a shot gun to the deer after they keep devouring my flower buds. Some plants I keep spraying and nurturing I don’t think I have ever soon bloom on my property but I keep on trying. I hope this is not a recurring event and the banana tree sees much better days. Sometimes they come back amazingly beautiful when we think they are destroyed beyond repair. Who even travels with a sack of used kitty litter? I thought cat loving people were much better than this! I can sympathize. I have had several women try to snip flowers from my garden. Walk into my yard in broad daylight. They should ask for advice if they admire something. I get cigarette butts a lot. I don’t understand people. Some people are so sorry. They have no concern for others about anything. Not many people have good manners anymore. I don’t understand people who do these things; I keep straw papers in my pocket or purse until I find a suitable trash can. I had gardens alongside a sidewalk in a neighborhood and routinely saw one woman picking one of my flowers as she would walk through the neighborhood ….. some people?!!? This is so sad. Bugs and fungus help me understand situations like this. Some people are more parasitic in nature than others. Your garden is beautiful. We lost a banana tree to deep frost in California one winter. It came back from a stump like yours and gave us fruit. Why do people do such cruel things? How can anyone get pleasure out of such destruction? Yes, I give you credit for continuing to have an interesting garden. More power to you. Hard to believe that someone can look at such a labor of love and have no qualms about destroying it. I’m smarter than that and won’t do anything dumb to lose my job, but I would love to be able to catch them in the act so i can beat the snot out of them.